Avram Grant appointed as manager. ★ 14th Aston Villa (a). 0-3. 21st Bolton Wanderers (h). 1-3. Noble. 24th Oxford United (h), Carling Cup - Round 2. 1-0. Parker. ★ 28th Manchester Utd (a). 0-3. 11th Chelsea (h). 1-3. Parker. ★ 18th Stoke City (a). 1-1. Parker. LP:... bottom! 21st Sunderland (a). Carling Cup - Round 3. 2-1. Piquionne, Obinna. ★ 25th Tottenham (h). 1-0. Piquionne. LP: Off the bottom! ★ 2nd Fulham (h). 1-1. Piquionne. LP: Bottom again! 16th Wolves (a). 1-1. Noble (pen). ★ 23rd Newcastle Utd (h). 1-2. Cole. LP: Still bottom! 27th Stoke City (h), Carling Cup - Round 4. 3-1 aet. Parker, DaCosta, Obinna. 6th Birmingham City (a). 2-2. Piquionne, Behrami. 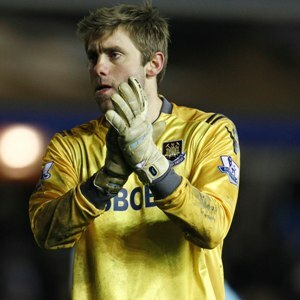 ★ 9th West Bromwich Albion (h). 2-2. Piquionne (pen), Parker. ✈ 13th Blackpool (h). 0-0. ★ 20th Liverpool (a). 0-3. ★ 30th Manchester Utd (h), Carling Cup - Round 5. 4-0. Spector, Cole. The highlight of a poor season! ★ 4th Sunderland (a). 0-1. LP: Still bottom! ★ 11th Manchester City (h). 1-3. Tomkins. 18th Blackburn Rovers (a). 1-1. Stanislas. ★ 26th Fulham (a). 3-1. Piquionne, Cole x2. ★ 28th Everton (h). 1-1. Kovac. 5th Newcastle United (a). 0-5. LP: ...and back to the bottom of the table! 8th Barnsley (h). FA Cup - 3rd Round. 2-0. Spector, Piquionne. ★ 11th Birmingham City (h). Carling Cup - Semi-final 1st Leg. 2-1. Noble, Cole. ★ 15th Arsenal (h). 0.3. LP: Don’t Ask! 22nd Everton (a). 2-2. Spector, Piquionne. ★ 26th Birmingham City (h). Carling Cup - Semi-final 2nd Leg. 1-3. Cole. 2-0 up in the tie by half time, only to crumble in the second half! ★ 1st Blackpool (a). 3-1. Obinna x2. Keane. LP: 2 Off the bottom! ★ 5th Birmingham City (h). 0-1. Back on the bottom! 12th West Bromwich Albion (a). 3-3. Ba (x2), Cole. 3-0 down at half time, Scott Parker gives the half time talk...! ★ 21st Burnley (h). FA Cup - 5th Round. 5-1. Cole x2, Reid, Hitzlsperger, Sears. 5th Stoke City (h). 3-0. Ba, DaCosta, Hitzlsperger. ★ 13th Stoke City (a). FA Cup - Quarter Final. 2-1. Piquionne. ★ 19th Tottenham Hotspur (a). 0-0. ★ 2nd Manchester United (h). 2-4. Noble x2 pens. 2-0 up at half time, only to crumble in the second half! 9th Bolton Wanderers (a). 0-3. 16th Aston Villa (h). 1-2. Keane. ★ 23rd Chelsea (a). 0-3. ★ 1st Manchester City (a). 1-2. Ba. LP:Bottom! ★ 7th Blackburn Rovers (h). 1-1. Hitzlsperger. LP:Bottom! Loan signing Robbie Keane misses a sitter with minutes to go! ★ 14th Wigan Athletic (a). 2-3. Ba. LP:RELEGATED! 2-0 up at half time, only to crumble in the second half! Sound familiar? ✈ 22nd Sunderland (h). 0-3. 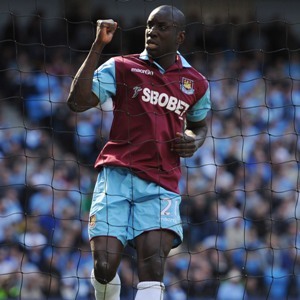 11 x Carlton Cole (Carling Cup x4, FA Cup x2). 8 x Frederic Piquionne (Carling Cup x1, FA Cup x2, Pen x1). 7 x Victor Obinna (Carling Cup x1, FA Cup x3). 6 x Scott Parker (Carling Cup x2). 5 x Mark Noble (Carling Cup x1, Pen x3). 4 x Jonathan Spector (Carling Cup x2, FA Cup x1). 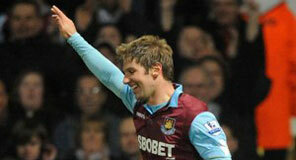 3 x Thomas Hitzlsperger (FA Cup x1). 2 x Manuel Da Costa (Carling Cup x1). 2 x Freddie Sears (FA Cup x1). 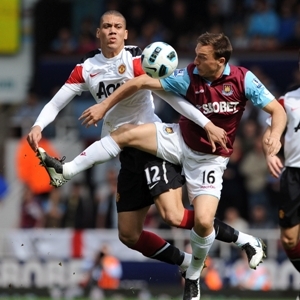 1 x Winston Reid (FA Cup x1).